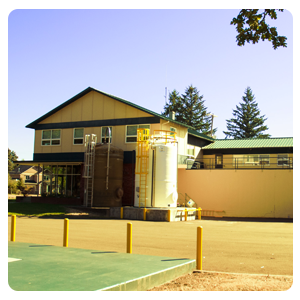 The treatment plant is located on Hunter Ave. above the Clackamas River in the Park Place neighborhood. The South Fork Water Board Treatment Plant was constructed between 1958 -1959 to augment the existing gravity water supply system. Extensive upgrading, expansion and treatment modification have occurred during the past several years. The plant treats water from the lower Clackamas River to produce a high quality, soft water for domestic and industrial purposes in the cities of Oregon City and West Linn. The purpose of water treatment is to purify the surface water of the Clackamas River and to remove objectionable or detrimental materials and to produce a high quality safe water for domestic consumption. The treatment process includes flocculation, sedimentation, filtration, and chlorination of the raw water to remove any harmful bacteria. This is called a “conventional” treatment process. The flocculation process coagulates (joins together) particles with the alum so that they settle out of the water as sediment. Sedimentation is simply a gravity process that removes flocculated particles from the water. Filtration removes remaining particles from the water supply. Those particles may include silt, natural organic matter, and microorganisms. Filtration clarifies water and improves the effectiveness of disinfection. Water is then disinfected with chlorine to ensure that dangerous microbes are killed. Chlorine also provide residual protection against biological contamination in the water distribution system.